For 5,000 years the horse has been an ever-present ally in war and peace. Civilisations have risen and fallen on their backs and evidence of the horse’s use is everywhere to be seen. Yet somehow, following the increasing pace of mechanisation in the 1930s, we have so quickly forgotten how indebted we are to the domestication of this animal. Before the development of the steam locomotive in the early 1800s, the only way to travel on land faster than human pace was by horse. Since travel is one of the defining features of human development, so the history of the horse is the history of civilisation itself. The upcoming exhibition The horse: from Arabia to Royal Ascot (opening 24 May) explores how horses have helped to shape our history for thousands of years. Horses were first domesticated in around 3500 BC, probably on the steppes of southern Russia and Kazakhstan, and introduced to the ancient Near East in about 2300 BC. Before this time, people used donkeys as draught animals and beasts of burden. The adoption of the horse was one of the single most important discoveries for early human societies. 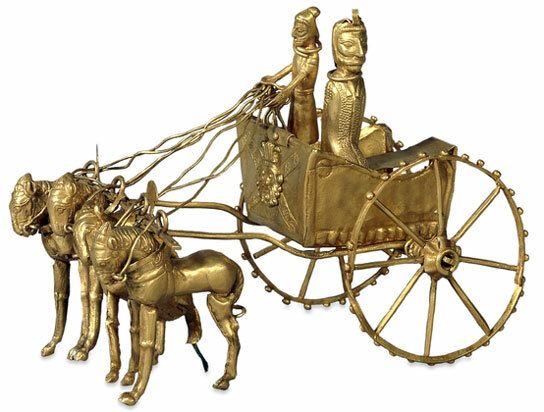 Horses and other animals were used to pull wheeled vehicles, chariots, carts and wagons and horses were increasingly used for riding in the Near East from at least c. 2000 BC onwards. Horses were used in war, in hunting and as a means of transport. They were animals of high prestige and importance and are widely represented in ancient art, often with great insight and empathy. The exhibition looks at how and why Middle Eastern horses, especially Arabians, were especially sought after and introduced into Britain for selective breeding between the 17th and 18th centuries, and shows how the vast majority of modern Thoroughbred racehorses are descended from just three celebrity stallions. Paintings, including famous works by George Stubbs and William Powell Frith, prints, silverware and memorabilia explore horses in British society, especially in recreation and competition, from race meetings through to modern Olympic equestrian events. So, how indebted are we to the horse? We hope that this exhibition will help remind us of the long and fruitful alliance between humans and horses. The horse: from Arabia to Royal Ascot was on from 24 May to 30 September 2012. The exhibition is supported by the Board of Trustees of the Saudi Equestrian Fund, the Layan Cultural Foundation and Juddmonte Farms. In association with the Saudi Commission for Tourism & Antiquities.